• Arabian Healthcare Group on a mission to prevent, treat and help patients manage Diabetes with a special focus on complications of the disease. • Group’s Wellness Division to work with corporate and schools to prevent the epidemic. • Huge gap of Endocrinologist sessions in Dubai alone. First phase to see launch in Dubai and RAK. Aims to establish 1 in each of the seven emirates by 2020. 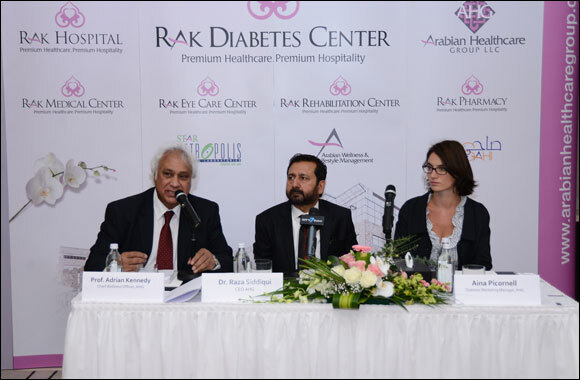 April 8, 2015; Dubai, UAE: Undertaken by Government of Ras Al Khaimah, Arabian Healthcare Group (AHG), a premium global healthcare management and consulting firm has announced its massive plan of setting up a chain of world-class Comprehensive Speciality Diabetic Care “RAK Diabetes Centers”across UAE in each of the seven Emirates by the end of 2020.The first phase will witness the launch of 2 Diabetes Centers in Dubai and Ras Al Khaimah. The center in Ras Al Khaimah has had a soft opening in 2014 whereas the Dubai Center will be functional within the next few weeks. Expanding its tradition of fostering excellence in healthcare laterally, the Arabian Healthcare Group is on a mission to prevent, treat and help patients manage diabetes. These premium stand-alone Specialty Centers will be the one-stop shop for diabetes prevention, care and management, offering a wide-range of services. The state-of-the-art, Diabetes Center aims to offer Comprehensive Diabetes Care by providing access to a multidisciplinary team including Cardiologists, Ophthalmologists, Nephrologists, Endocrinologists, Diabetes Educator, Dietician, Obesity Management, Podiatrist as well as clinical testing all under one roof.Diabetes is a complex disease that affects all major systems of the body. These complications include heart disease, neuropathy, kidney failure, vision loss and diabetic foot wounds. The goal of the Diabetes Center is to encourage patients to receive early specialty care and education – getting them on the right track on controlling their diabetes. The services at the Centre will allow the highest level of specialized patient care from first diagnosis to the management of all the complications associated with diabetes. With a mission to increase awareness, education and reduce incidence of diabetes, the center will focus on providing people with diabetes complete care, education and support. “Arabian Healthcare Group aims to be the leader in all aspects of Diabetes Care including prevention, management and prevention of complications. The opening of the RAK Diabetes Center in Dubai will be our first specialty center in the Emirate. As per industry sources, there is an actual demand-supply gap of Endocrinologists sessions, which means a deficit in the Endocrinology specialty in the UAE, especially in Dubai. Our commitment towards the residents of the UAE to prevent Diabetes and decrease the demand-supply gap in Endocrinologists, has made AHG target this illness in all its dimensions”, said Dr. Raza Siddqui, CEO Arabian Healthcare Group. “Considering that the epidemic requires special focus, AHG plans to have at least 1 Diabetes Center in each Emirate by 2020, but due to the high population density Dubai will see 2 additional centers. Our lifestyle management division, Arabian Wellness will work on initiating programs for Corporate and School Health in Dubai and other Emirates whereas an alliance with Emirates Diabetes Society is also on the agenda”, added Dr. Raza. “Our Diabetes Center will offer diagnosis, assessment, education, management, and multidisciplinary care. Patient-centered care is at the heart of everything, whether that means basic education, personal advice on what food to eat and how to take medications, or the finer points of insulin pump use or continuous glucose monitoring. While there is currently no cure for diabetes, it can be controlled, allowing people to have full, productive lives. By integrating diet, oral medication or insulin, and patient education, the Diabetes Center works to achieve the best possible outcome, helping people with diabetes to live long and healthy lives”, said Aina Picornell, Diabetes Marketing Manager at Arabian Healthcare Group. The number of people who suffer from diabetes worldwide is 387 million and this number is expected to reach 592 million by 2035.Seven of the top 20 countries when it comes to diabetes prevalence are from the Middle East and North Africa region with the Gulf States leading the unfortunate statistics. Saudi Arabia takes the top spot in the region in terms of diabetes prevalence with almost 24%of its population living with the disease. Kuwait is second with 23.1%followed by Bahrain (21.9%), Qatar (19.8%) and United Arab Emirates with 19%. While estimates have it that about half the people with diabetes may still be undetected and another 15-20% are pre-diabetic. This makes the figures quite astonishing hence the need for such specialized centers. Within the AHG, 2 of its verticals namely Arabian Wellness & Lifestyle Management and RAK Diabetes Centers will be working intensely to prevent Diabetes and help Diabetic patients manage their disease and its complications.Arabian Wellness & Lifestyle Management was launched in August 2012, in order to manage the health of Corporate Employees & School Children. In both cases Arabian Wellness is implementing Medical & Health Screening of all employees & school children; The Health & Lifestyle Audit of all organizations; Health Management Counseling, Education, Talks & Empowerment plus Sports & fitness programs, Weight Management, Quit Smoking forums etc.Annually they target 100 Corporate organizations, and all private schools in Ras Al Khaimah, with the objective of Health Improvement, Weight Management, Stress reduction, Diabetes Management, Cardiac Care, Cancer Prevention, etc.